NEW BEDFORD, Mass. 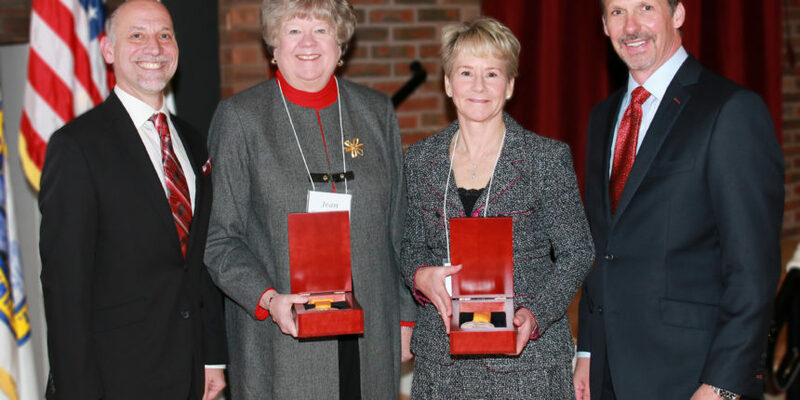 — Southcoast Health announced today that Dr. Jean MacCormack and Linda Bodenmann were each awarded the Trustees’ Medal for Outstanding Service at its Annual Meeting on December 5 at the Whaling Museum in New Bedford. The Trustees’ Medal is presented to individuals who have shown exemplary service, selfless giving and commitment to the goals and mission of the health system and hospitals. It is considered the very highest honor the Southcoast Board of Trustees can bestow — one that marks a lifetime of dedication to the health care of our communities. Dr. MacCormack served Southcoast Health with distinction for 15 years and provided strong, insightful leadership as Chair of the Board for three of those years. In that time, she came to be known as the embodiment of integrity, always keeping the best interests of our patients in mind. She has proven to be a most-trusted advisor — laser-focused on Southcoast Health’s mission and vision and the steps it would take to realize them. Dr. MacCormack also supported Southcoast Health’s mission through her generous philanthropy. Her accomplishments and contributions have been numerous, and ongoing as she continues to serve as co-chair of the $25 million Campaign for Southcoast along with Nick Christ from BayCoast Bank. Bodenmann, Executive Vice President & Chief Operating Officer, who will retire in January, has been an invaluable leader for our healthcare system as we have worked to navigate the challenging environment we face. Linda has always been eager to pursue new opportunities that would benefit Southcoast Health, and has always embraced a challenge. There is no question that Linda has made an indelible impact on Southcoast Health during her 23 years of leadership at our organization.